November 2018 Issue- SCOTTSDALE, Ariz. — ‘Across nearly every industry, the relationship between consumers, suppliers and intermediaries has changed so much over the last decade, it’s nearly unrecognizable today’. October 25, 2018- SCOTTSDALE, Ariz. — CommLoan announced today that it was selected as a winner of the Growth Stage Competition by Bend Venture (BVC) LLC at the 15th Annual Bend Venture Conference, taking home a $100,000 investment. October 19, 2018- BEND, OR — Economic Development for Central Oregon (EDCO) hosted the 15th Annual Bend Venture Conference (BVC) to a sold-out crowd at the Tower Theatre in Downtown Bend. Over the past two days, 14 companies presented their ideas to 600 attendees in hopes of gaining investments from prominent funds. October 15, 2018- SCOTTSDALE, Ariz. — CommLoan, announced today that it was selected as one of five Growth Stage finalists by the Economic Development for Central Oregon (EDCO) to advance to the 15th Annual Bend Venture Conference (BVC). 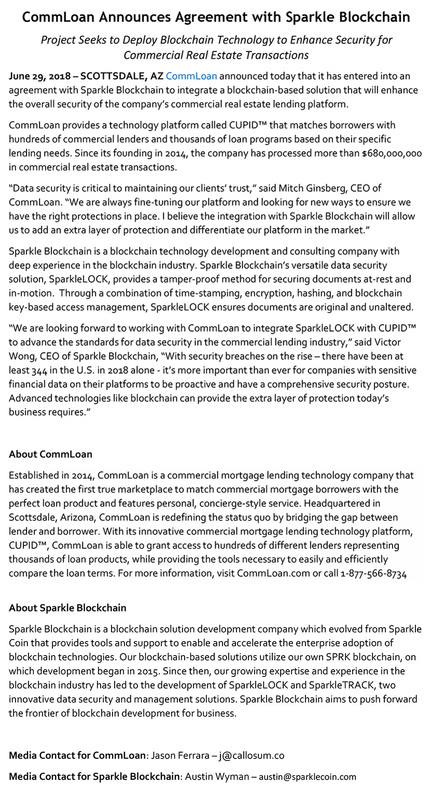 June 29, 2018- SCOTTSDALE, AZ — CommLoan announced today that it has entered into an agreement with Sparkle Blockchain to integrate a blockchain-based solution that will enhance the overall security of the company’s commercial real estate lending platform. 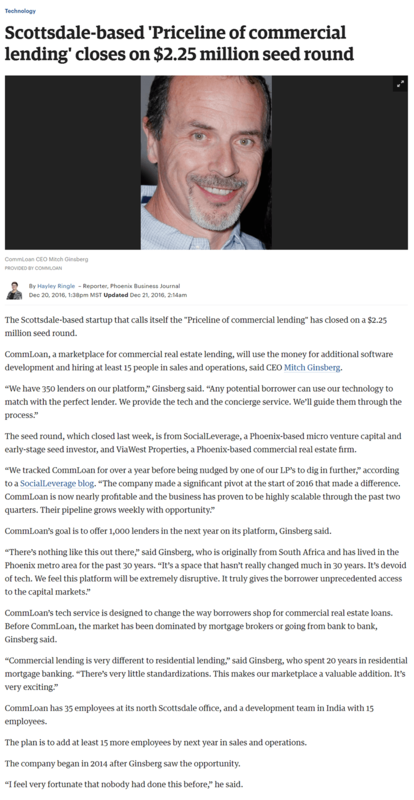 NOVEMBER 1, 2017- SCOTTSDALE, Ariz.— CommLoan, the first digital marketplace for commercial real estate lending, announced today that it has successfully processed more than $680,000,000 in loans. This marks a significant milestone in the company’s short 3-year history. 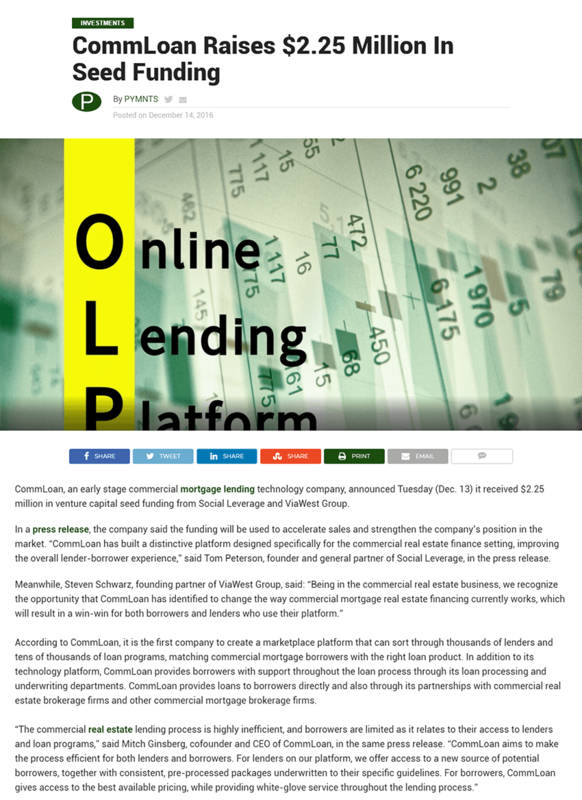 JULY 2017 TECH SPOTLIGHT- In 2016, CommLoan launched the CUPID Platform (Commercial Underwriting Pricing Index Data), a technology based platform that matches the Borrower’s needs with the right lenders based on the specifics of the deal. 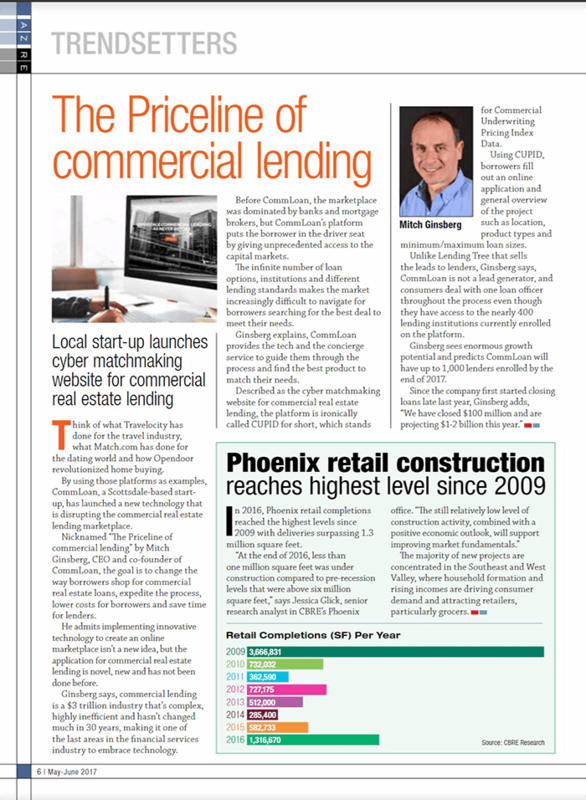 CommLoan’s CUPID platform is bringing efficiency to the commercial real estate lending space. JUNE 3, 2017- CommLoan redefines how commercial real estate loans are originated and financed by introducing the first marketplace for commercial real estate lending. CommLoan’s marketplace connects Borrowers to the right loan programs that fit their specific needs. 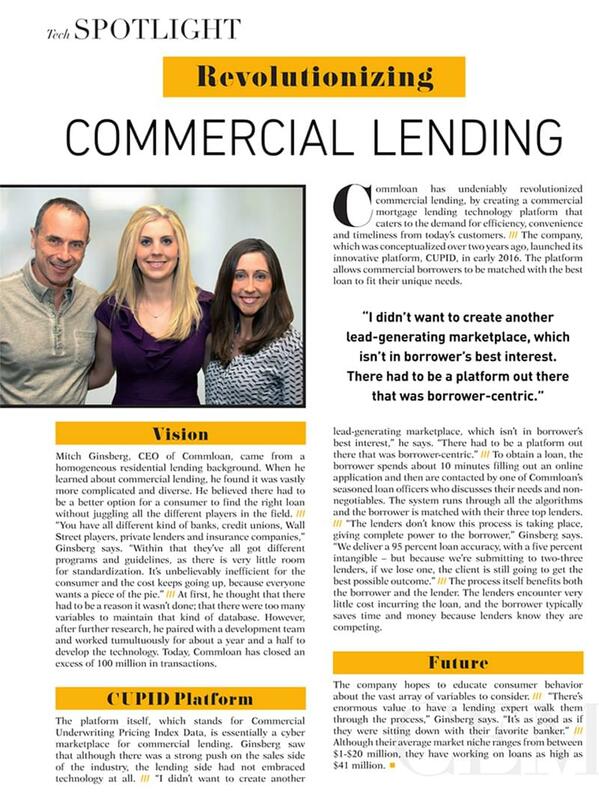 MAY/JUNE 2017 TRENDSETTERS- CommLoan is revolutionizing the commercial real estate lending experience with new technology that expedites the loan process, provides Borrowers with the right options and saves Lenders time searching for leads that fit within their specific focus. 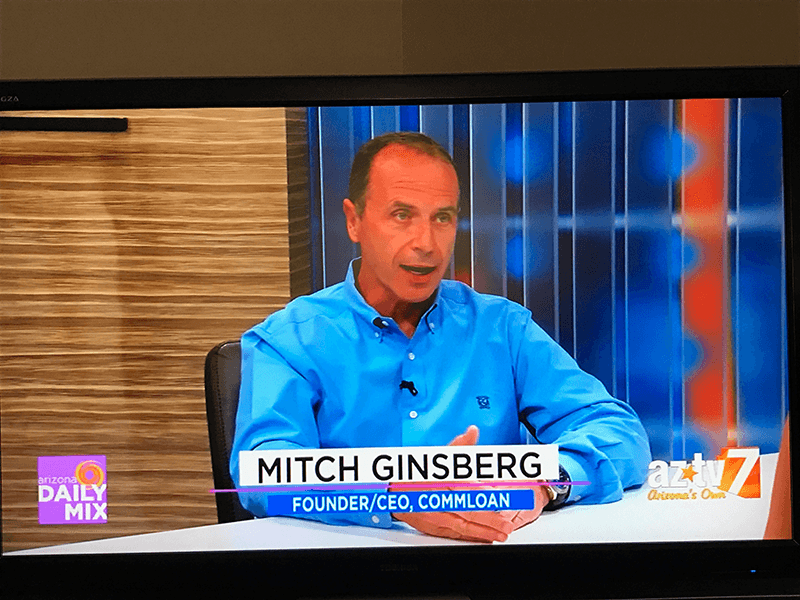 On Tuesday, April 4th, CommLoan’s CEO Mitch Ginsberg was featured on AZ TV’s Tech Tuesday, discussing how digital marketplaces are changing and shaping consumer behavior. In his interview with Daily Mix anchor Catherine Anaya, Mitch described how the dotcom boom of the 1990s was the seed of the actual technology boom which we are experiencing today, forcing and allowing all businesses to interact with totally connected customer behaviors. 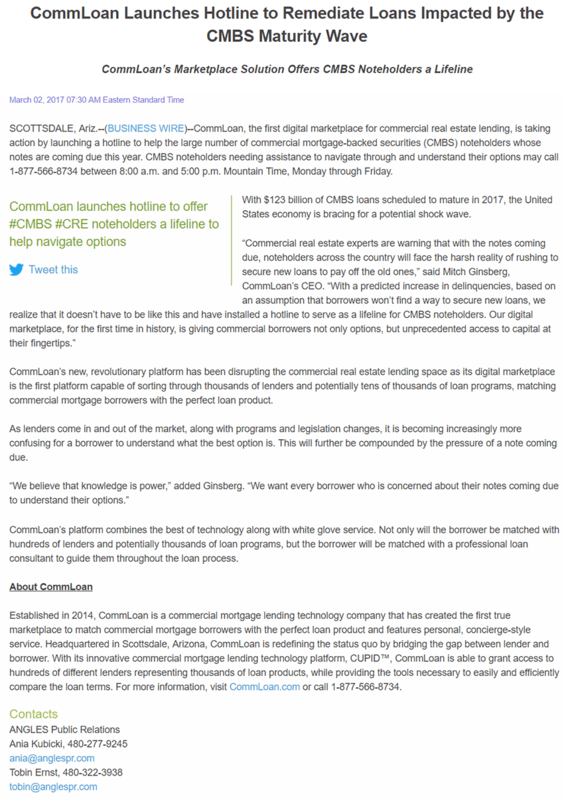 March 02, 2017- SCOTTSDALE, Ariz.--(BUSINESS WIRE)--CommLoan, the first digital marketplace for commercial real estate lending, is taking action by launching a hotline to help the large number of commercial mortgage-backed securities (CMBS) noteholders whose notes are coming due this year. CMBS noteholders needing assistance to navigate through and understand their options may call 1-877-566-8734 between 8:00 a.m. and 5:00 p.m. Mountain Time, Monday through Friday. 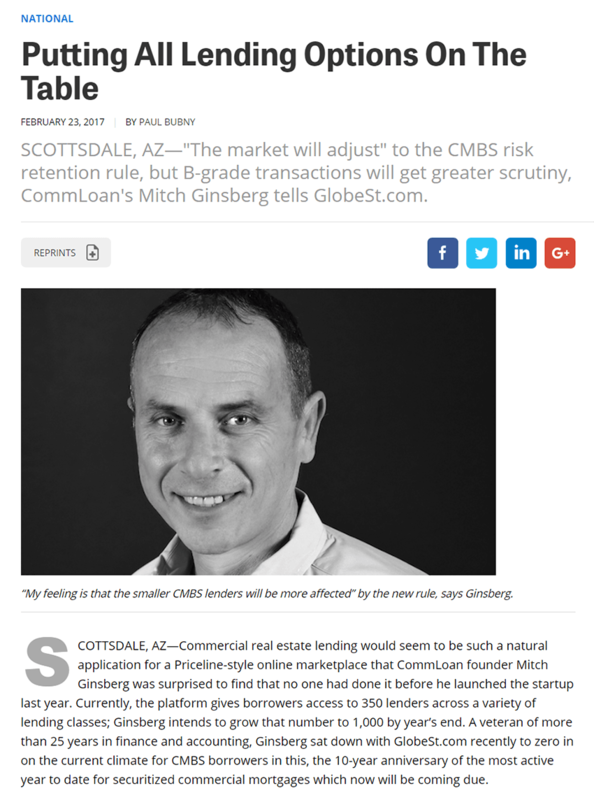 FEBRUARY 23, 2017- SCOTTSDALE, AZ—"The market will adjust" to the CMBS risk retention rule, but B-grade transactions will get greater scrutiny, CommLoan's Mitch Ginsberg tells GlobeSt.com. JANUARY 23, 2017- CommLoan, a Scottsdale-based early stage commercial mortgage lending technology company, has hired Alan Schnaid to join the leadership team as Chief Financial Officer and Chief Operations Officer. 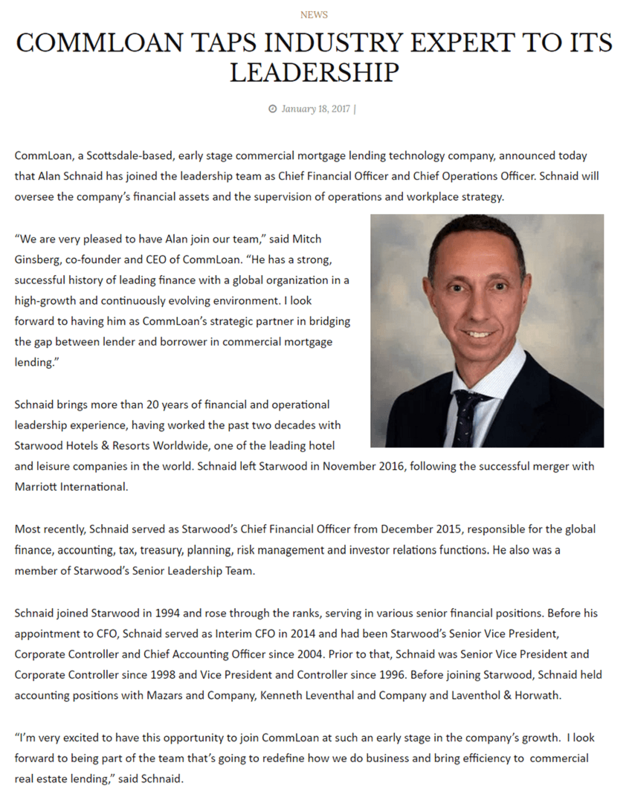 JANUARY 18, 2017- CommLoan, a Scottsdale-based, early stage commercial mortgage lending technology company, announced today that Alan Schnaid has joined the leadership team as Chief Financial Officer and Chief Operations Officer. 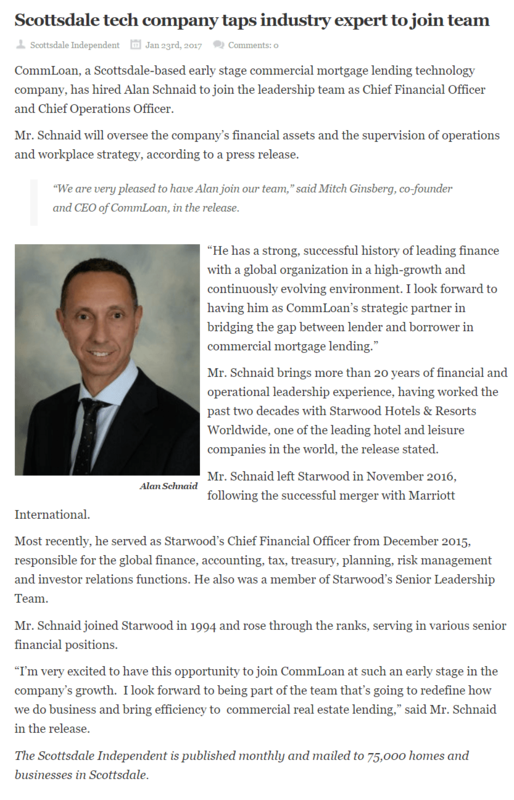 Schnaid will oversee the company’s financial assets and the supervision of operations and workplace strategy. 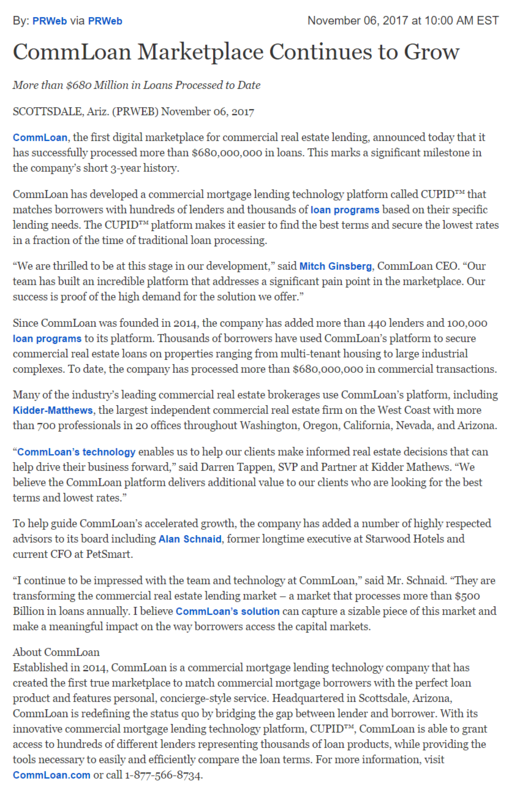 DECEMBER 20, 2016- CommLoan, a marketplace for commercial real estate lending, will use the money for additional software development and hiring at least 15 people in sales and operations, said CEO Mitch Ginsberg. 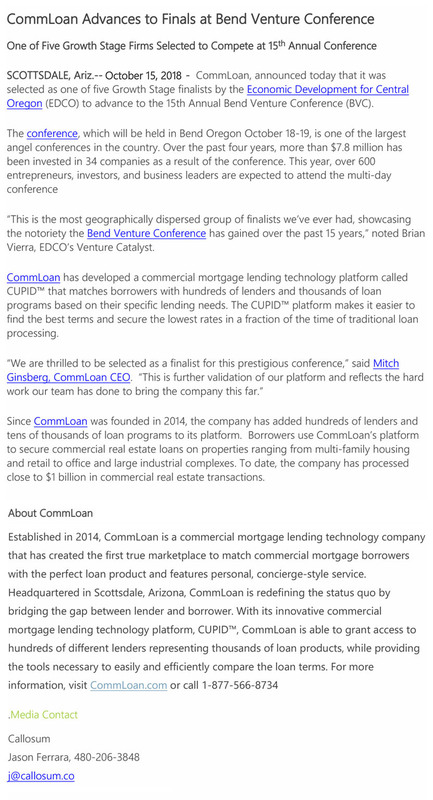 DECEMBER 14, 2016- CommLoan, an early stage commercial mortgage lending technology company, announced Tuesday (Dec. 13) it received $2.25 million in venture capital seed funding from Social Leverage and ViaWest Group.